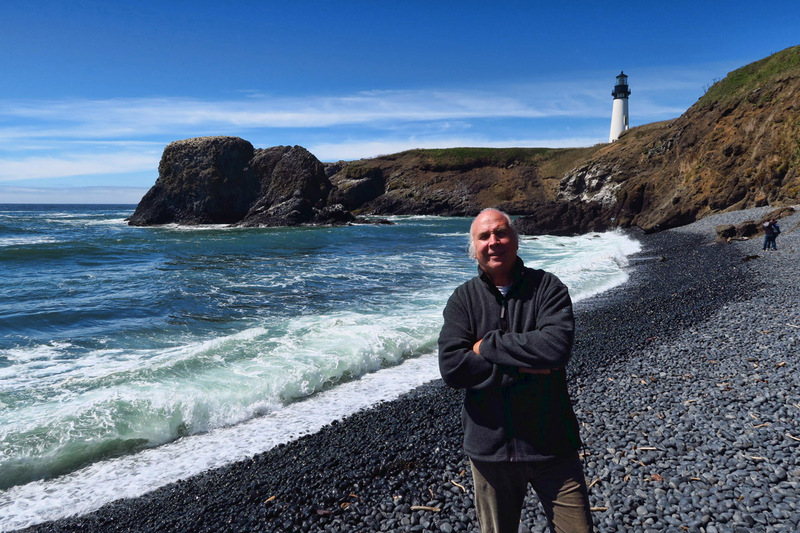 During my 2014 tour through the Pacific Northwest, I must have thought a thousand times, “Oh, Don would LOVE this place!” Some of our greatest outdoor adventures have been trips we have taken together, from my Dad’s cross country road trips from Texas to Knotts Berry Farm as kids, to tent camping in the wilds of Alaska. 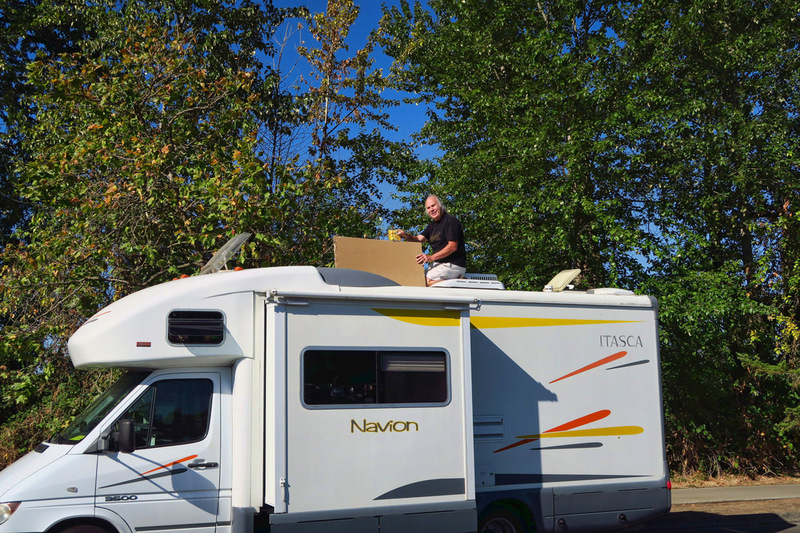 We even rented a nine-speed manual gear shift RV with a steering wheel on the “wrong side” to tour the South Island of New Zealand. So whenever I see a foggy mountaintop or steep, craggy coastline, my mind first turns to these memories of our good times. 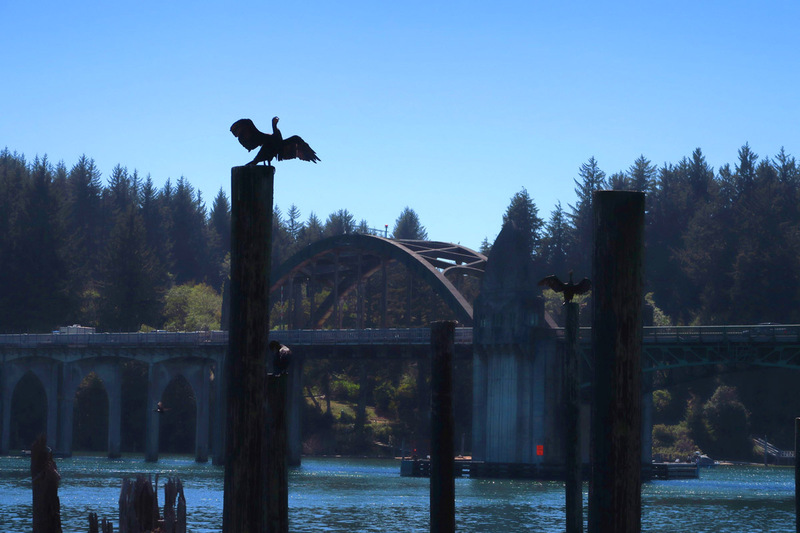 Cormorant dries his wings in front of the Siuslaw River Bridge in Florence. 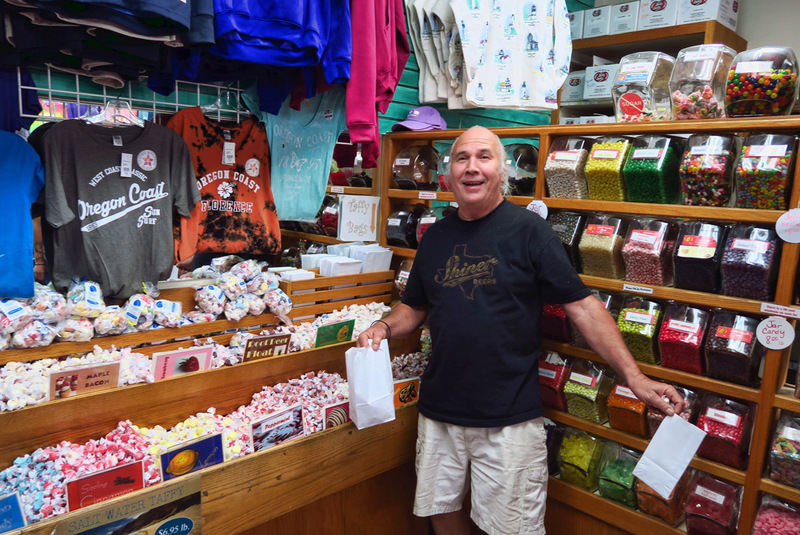 Don has a passion for salt water taffy. He’s come to the right place. 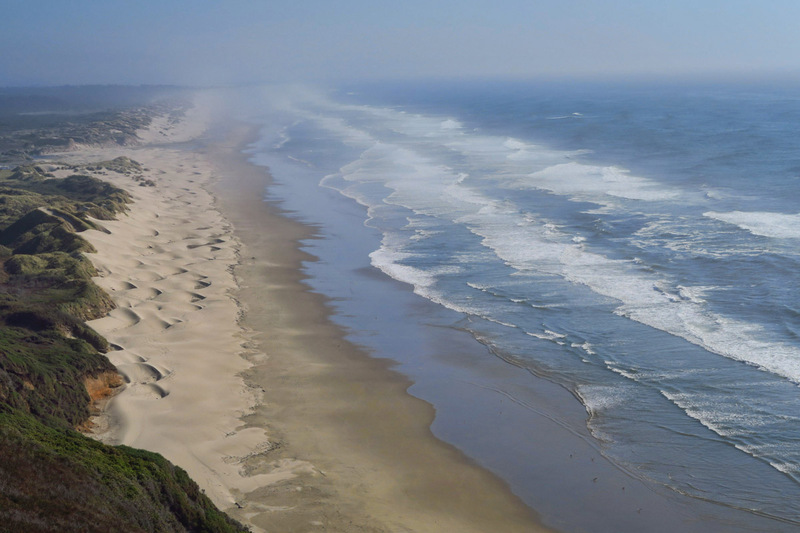 As I have mentioned before, traveling the Oregon Coast has been a challenge this summer. Seems like every single state park has a “Campground Full” shingle hanging out, even midweek. So add to that now trying to find space for TWO rigs, and it has been a bit stressful. Couple that with the fact that I have always been the “follower” and am now in the lead role, not a role I play very easily. As the “middle child” behind an Alpha-male Leo-the-Lion, I learned to enjoy a good game of “Follow the Leader,” as long as I don’t have to lead! Measuring for solar panels in the Eugene Valley River Center Mall. 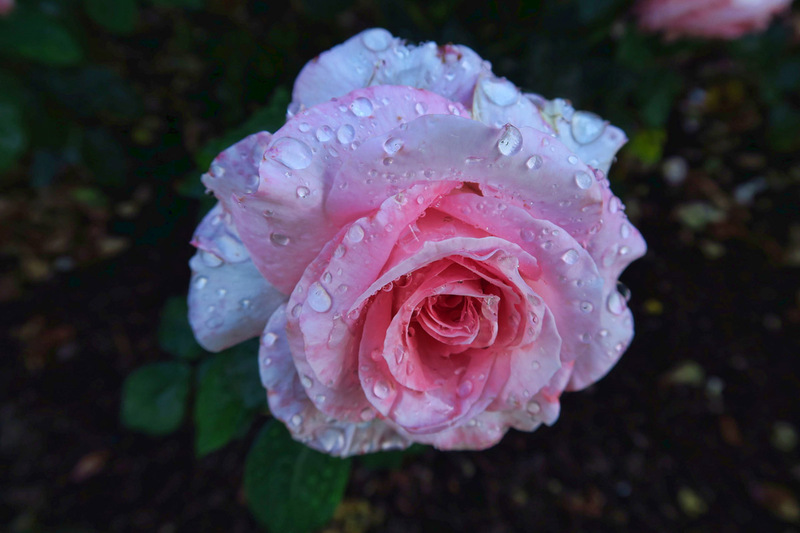 While Don is working on his solar survey, I go for a bike ride to my favorite spot in Eugene, the Owen Rose Garden. 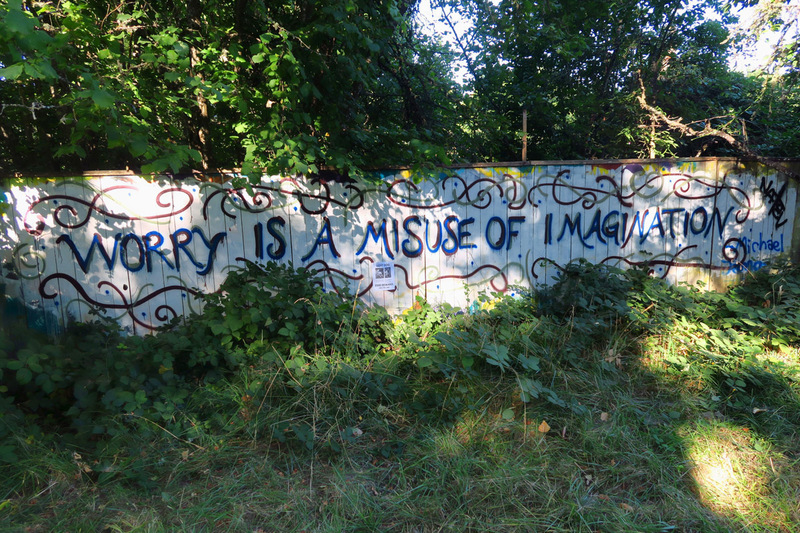 Seen along the Eugene bike path. 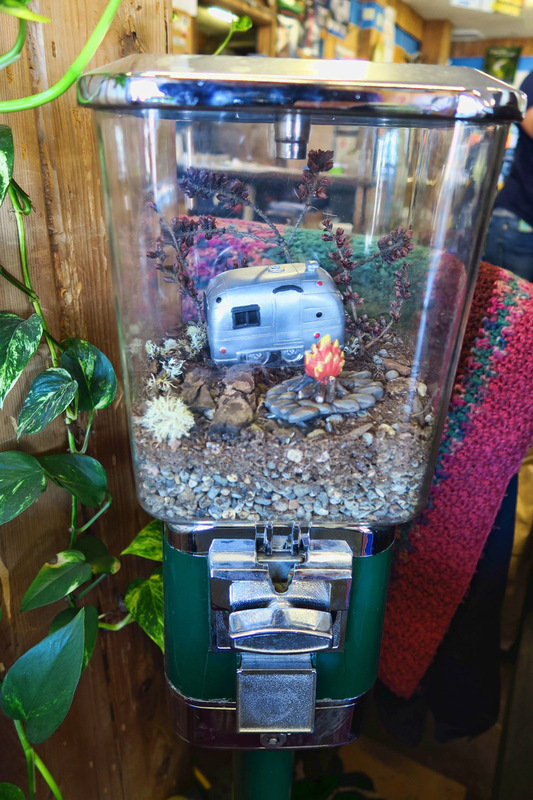 Airstream and campfire in the gum ball machine — Eugene RV Parts Store. 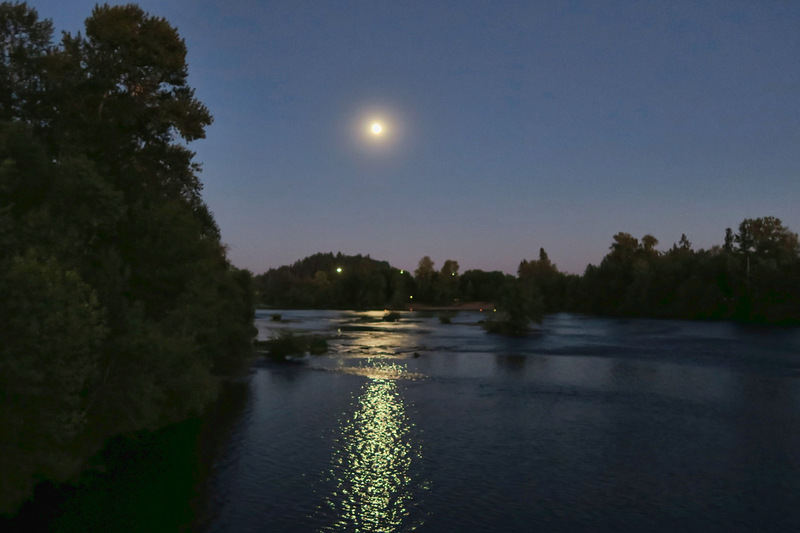 Full moon over Eugene’s Willamette River, just steps from the mall parking lot. We’ve had to get a bit inventive in finding places to park, like the fenced in gravel dry camping lot of Newport Marina, which happens to be right next door to the Rogue Brewery. How fortuitous! 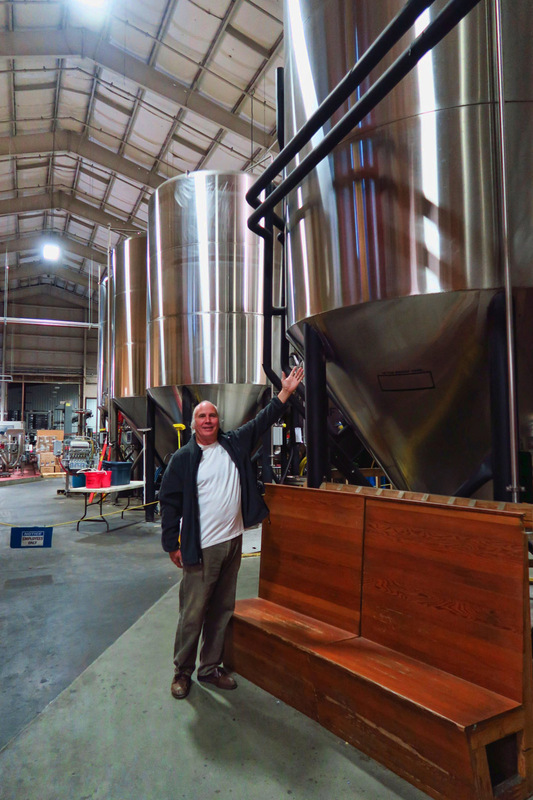 Beer tasting at Rogue Brewery. 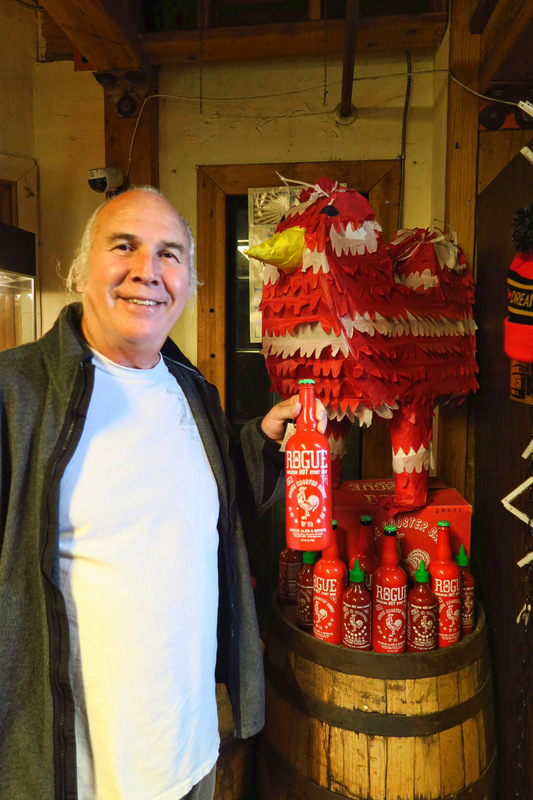 Rogue has a new beer…Sriracha Rooster Hot Sauce. Bought a bottle, but haven’t tried it yet. Demonstrating my Dad’s signature pose. 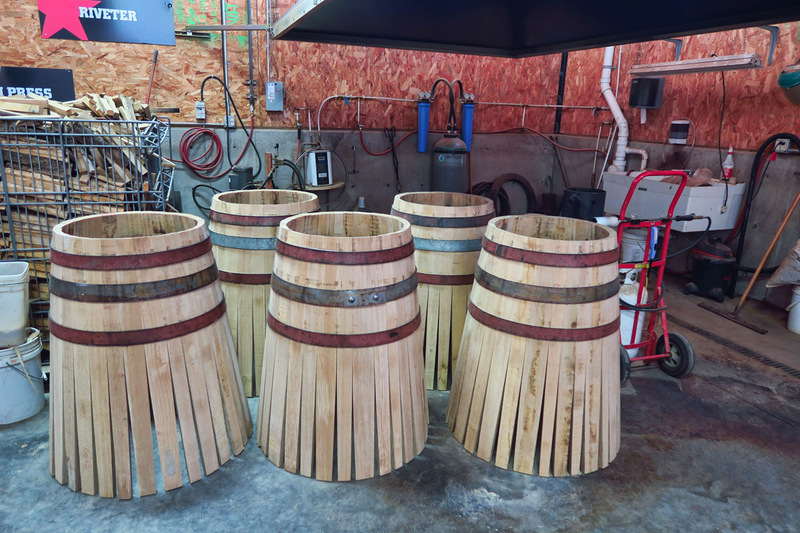 Not only does Rogue have a distillery, but they even make their own barrels by hand. Their “Rolling Thunder” barrel aged Imperial Stout was best beer I’ve had in months. We are transported between brewery and distillery buildings by passenger train. View out the Rogue Brewery Tap Room window. 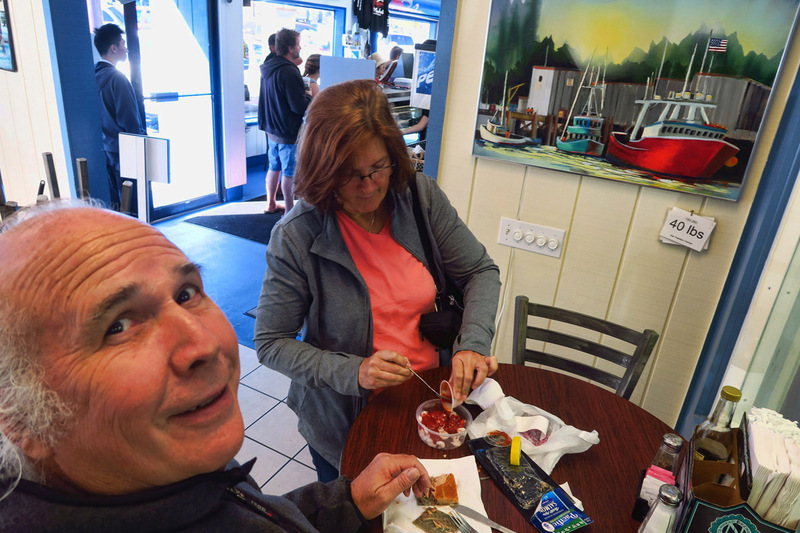 Newport is a great stop along the coast as it offers a picturesque seaport, beautiful beaches nearby, and not one but TWO lighthouses. 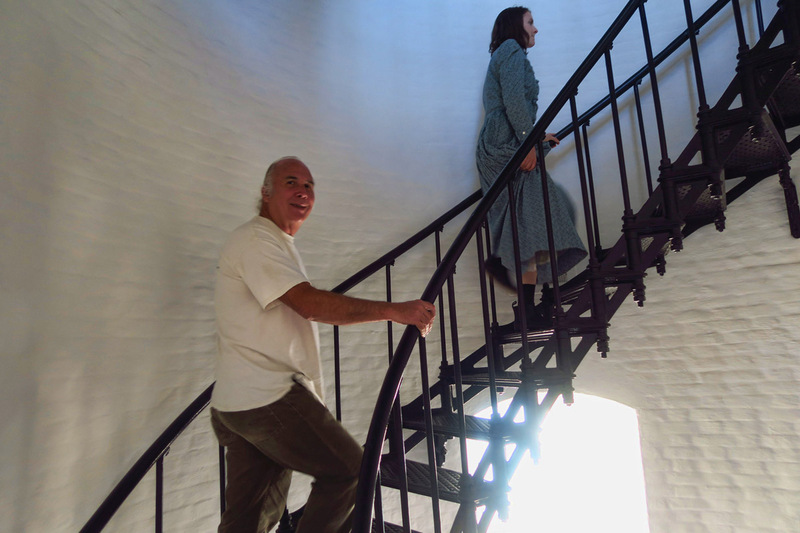 Any tour of “my favorite things” is going to include a mandatory lighthouse stop as I extol about the beauty of the Fresnel lens! 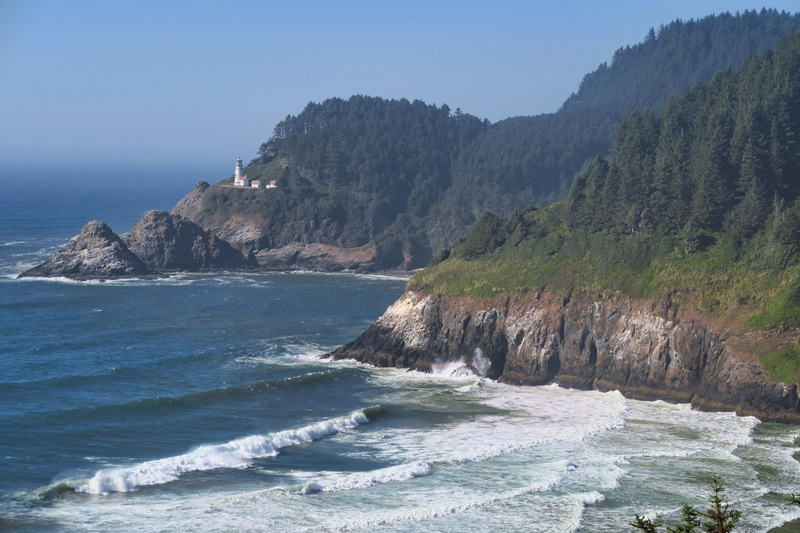 Overlook near Heceta Head Lighthouse. 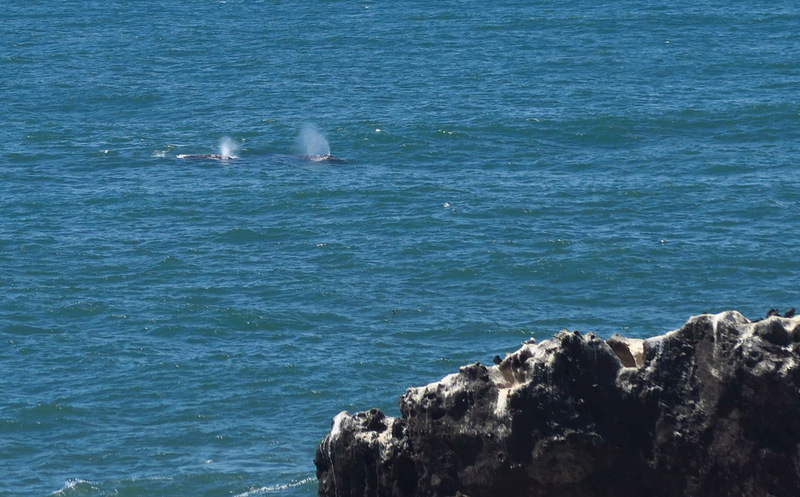 From Yaquina Head Overlook, we see…. 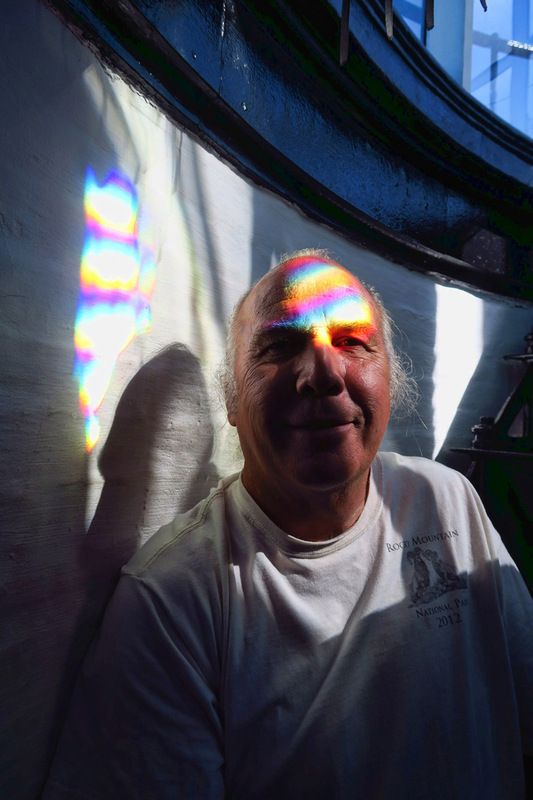 Demonstrating the wonder of the Fresnel Lens prisms. 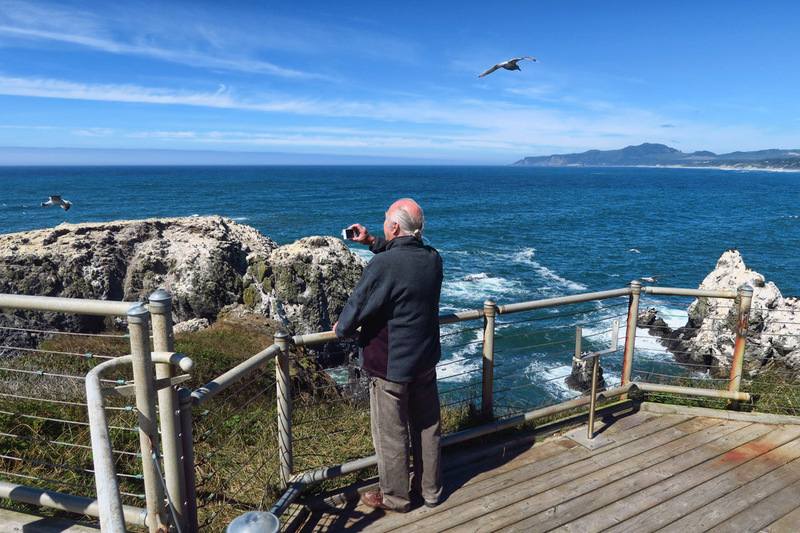 The further up the Oregon coast one travels along Highway 101, the availability of the state parks becomes inversely proportional to the price of the independently owned RV parks. As we pass one “Campground Full” sign after another, we pull off the road so I can consult my trusty AllStays App. How convenient that it directs me back to the nearest turnoff to the Blue Heron French Cheese shop. Although they are a member of the Harvest Host program, they also allow overnights for non-HH members. This may be the most unique place I have ever dry camped. But what a great way to prepare a meal! Go into the cheese shop, pick up a wheel of peppered brie and a chunk of blue cheese, and come back out to the rig and plan a meal around it! 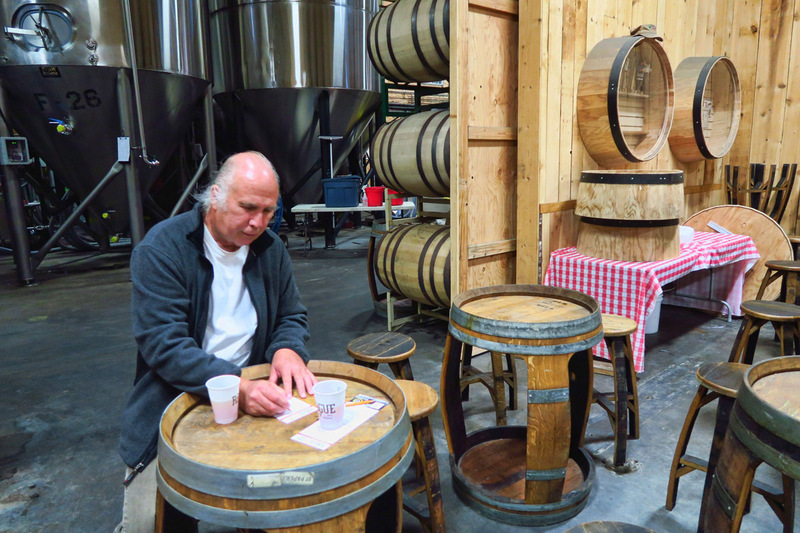 Sampling the cheeses at Blue Heron Cheese Factory. Dinner in the cheese factory parking lot. Tossed salad to go with smoked salmon and pepper brie. 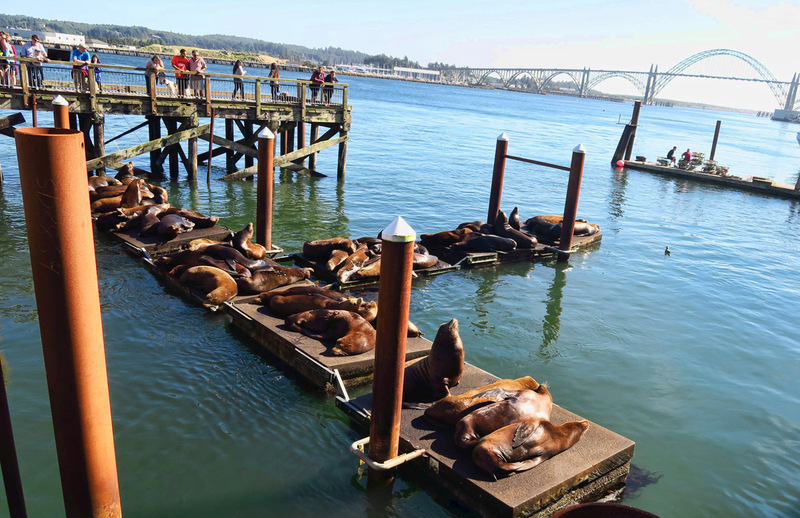 Transient Newport residents…California sea lions. Having lunch at The Fish Peddler in Newport. 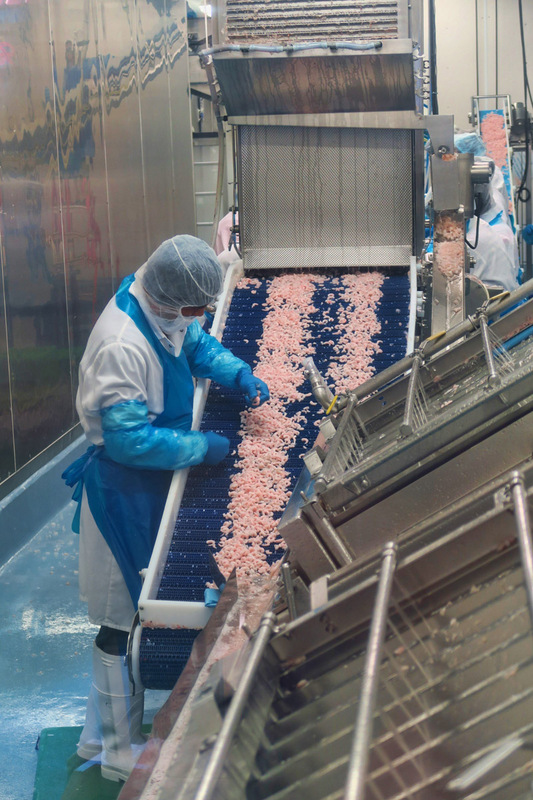 We are sampling the wild bay shrimp…. …while watching them being canned on the other side of the window by our table. 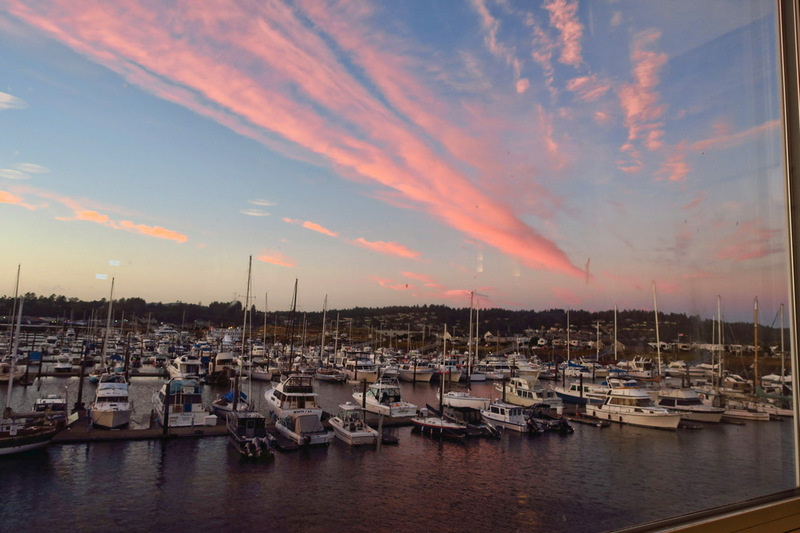 This entry was posted in Oregon and tagged Blue Heron Cheese Factory, Florence, Harvest Hosts, Newport, Rogue Brewery, Tillamook, Yaquina Head Lighthouse by Suzanne. Bookmark the permalink. 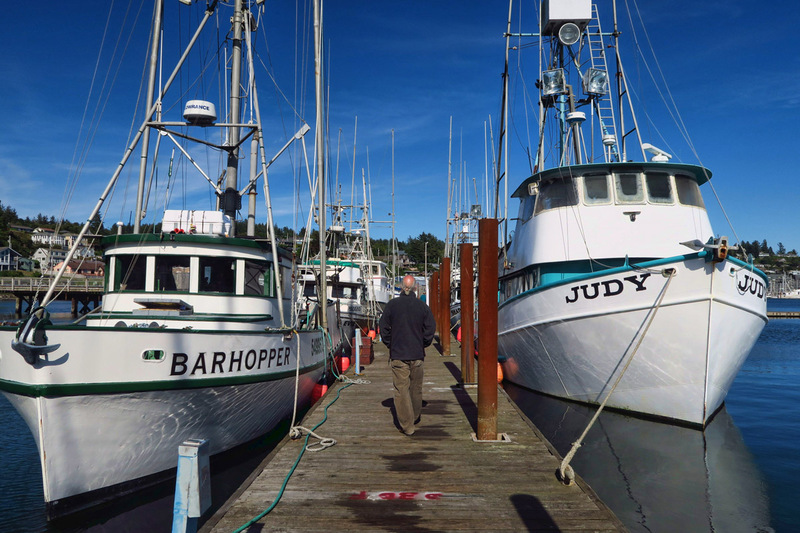 Now I have to go back to Tillamook again! I’m a big fan of the Blue Heron, but always fall for their smoked brie. 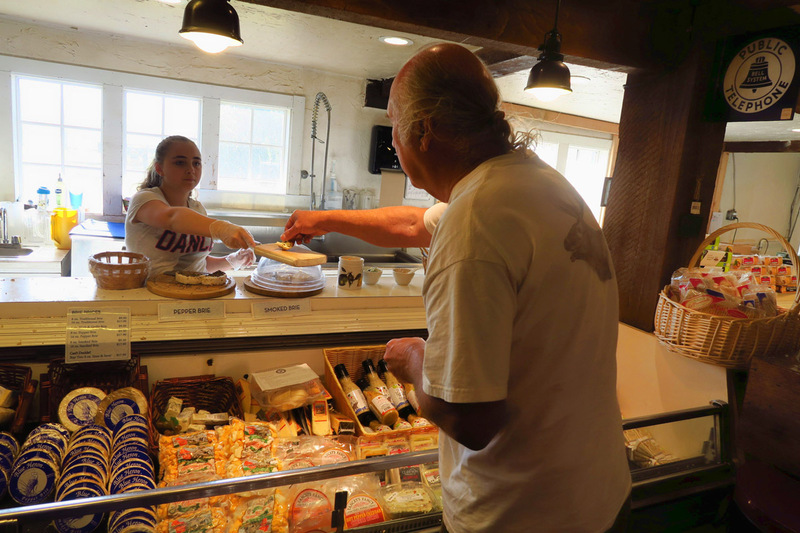 Now I need to go back and try that peppered brie – sounds wonderful! It’s so great to see you enjoying time with your brother! It’s so neat you got to show Don some of your favorite things! 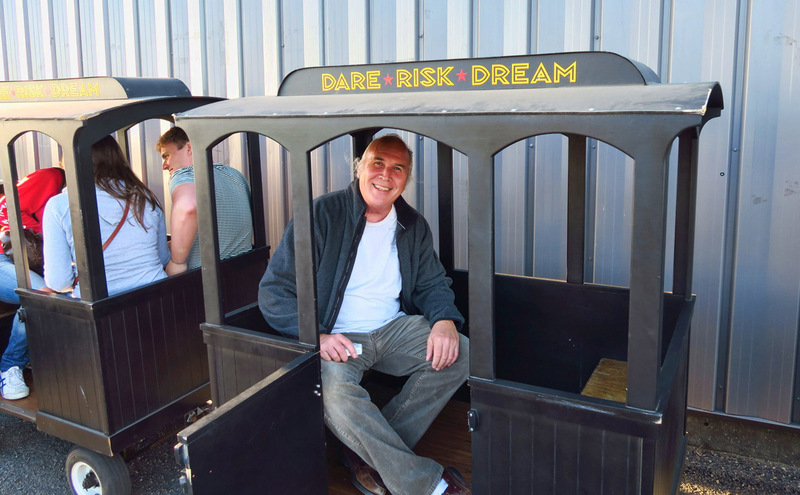 It must be little like a couple of big kids traveling on their own! I want a brother just like Don! His smile is so infectious! Every time I see it, my instinct is to do the same. What wonderful times you are having. I am soooo happy for you. It is glorious to be able to share these experiences with someone you love!! I’m so pleased for you both, that you can travel together! I’ve had some lovely times traveling solo, and nothing really tops sharing an experience. Oh to be traveling together again, this time by RV. Enjoy the new memories you are creating. Just maybe now Don can coax you into Mexico in your RV’s. What a surprise to find this, LOL. I was thinking that the theme of this post must be “Phases of the Moon” but then I realized all but one of them was of the back of my head :-). This must be your new plan to reduce blog work and to spend more time “on the trail” – photos of me! Yes, this is one of those points in my life where I feel in a time warp and it’s going to take some time I believe for me to realize “I am really there”. So far my guide is superb, the scenery magnificent, the pace driving, the parking challenging, the experience breathtaking and the thoughts unforgettable. Thanks Sis! How nice that you have a brother who likes to eat and drink beer as you do. Must be in the genes! You had me at bourbon-barrel aged imperial stout. Don’t remember much after that (well, except the lighthouse buts). Glad you found some good spots to park despite the summer craziness. Seafood, beer, and salt water taffy,. 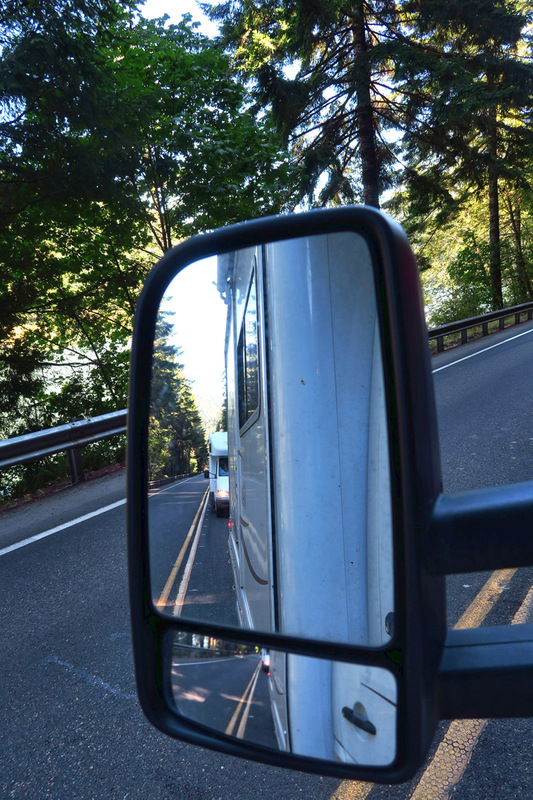 Don might be in your rearview mirror for a long time :). Don seems to be a master of the selfie shot among other things! 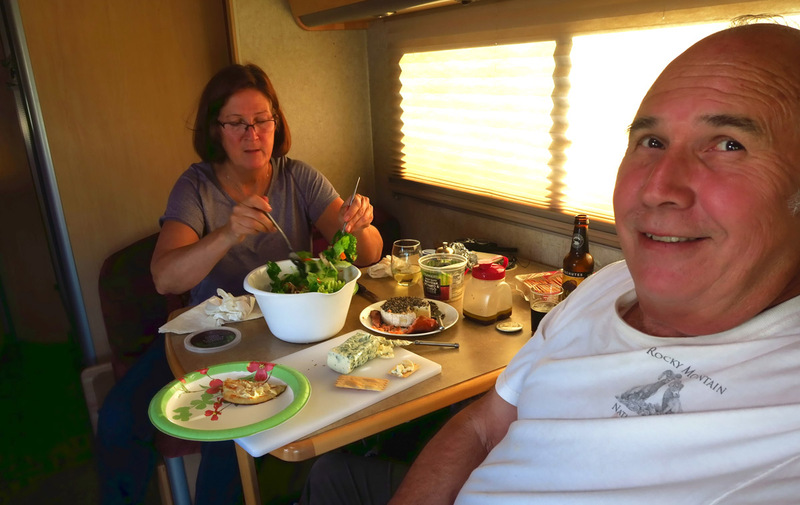 Looks like you guys are having a great time, full campgrounds or not. We’re off in the am to the V/N rally at Grand Marais and then over to Glacier by way of Teddy Roosevelt NP….maybe we’ll see you along the road? Great post! 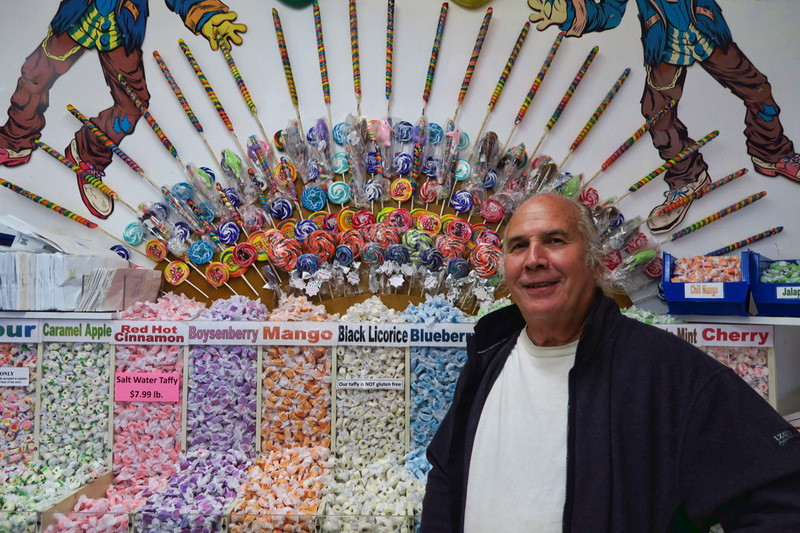 I wish I had a sister that would take me for taffy. Keep those pictures coming! They are a real joy to see. What fun even with the parking challenges. Looks like there is lots of good eating and drinking going on. Enjoy your time together! 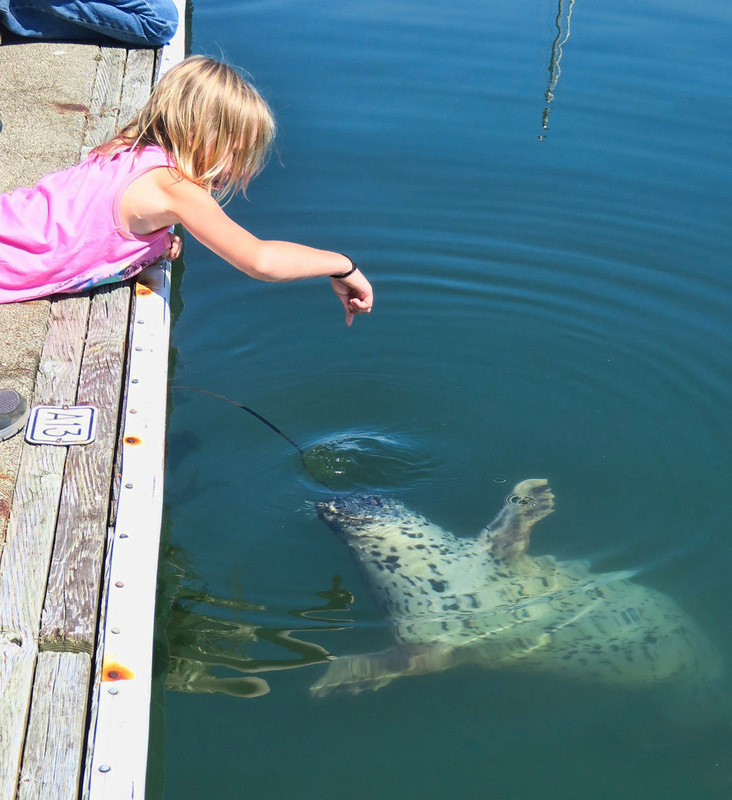 This post made me long for our days traveling the Oregon coast. How great to have your brother along for the ride. I am a middle child as well but also a Leo, so I vacillate between wanting to be the follower yet having that desire to be the leader. Fingers crossed that you get a place to stay in Astoria, a city we really love. Bonding with your brother – so special for you both. Good thing you have similar interests. Happy for you both. Great pictures, as always. Although I like to explore alone sometimes it’s extra special to share with a loved one. Very cool opportunity to share a few of your favorite things/places. You both look happy.